Many people would be surprised at the notion of quality cycle-touring so near Southern California’s twin monster metroplexes, Los Angeles and San Diego. But local riders know there are wonderful treasures buried up in the high hills surrounding the overdeveloped coastal basin…in the Angeles, San Bernardino, and Cleveland National Forests. This is one of the hilliest tours we offer, with many long, sustained climbs—some of them quite steep—as well as some of the sweetest downhills you’ll ever do. As the tour’s finish is at a lower elevation than its start, you actually do more descending than climbing, with the final day being almost entirely downhill. You won’t have to wait that long for a payback on all the effort you put in on the climbs though, as there are large and small descents every day, and also there is the reward of all the breathtaking panoramas from the tops of the many hills you’ll be working so hard to ascend. The tour essentially follows the north-to-south course of four mountain ranges: the San Gabriel, San Bernardino, San Jacinto, and Laguna Mountains. Along the way, the scenery varies from chaparral and near-desert to mountainous, almost alpine grandeur, to rolling grasslands and charming, hilly orchards…little farms that seem quite out of place in a region commonly considered hot and dry. It’s the altitude that does it: the higher you go, the greener it gets (more or less). You will be amazed at how beautiful and peaceful this tour can be. 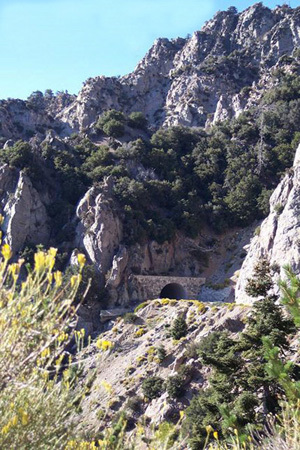 Lots and lots of climbing, as your work your way up to and then along the length of the Angeles Crest Highway (photo). Although there are almost no really steep pitches, it’s hard to hide that 10,000′ elevation number. It adds up to a long day. Most of the climbing is long and gradual. Camp at a group site on top of a mountain, amid towering, snow-capped peaks. No showers, but good, modern bathrooms with hot water. Drop out of the San Gabriel Mountains and climb into the San Bernardino Mountains on the way to an overnight at a camp on the shore of Big Bear Lake. Includes some really fast downhills and some really tough climbs. A great run along aptly named Rim of the World Drive with views to forever. Showers at camp. After a long climb to the high point on the tour (8443′ Onyx summit—highest pass in Southern California—begin one of the longest descents in the state: over 30 miles of almost continuous high speed hi-jinx. Skirt the suburbs of Yucaipa and explore the apple orchard highlands around picturesque Oak Glen before descending—another great downhill—to the small city of Banning. Stay in a motel in Banning. After leaving Banning, begin another long, gradual climb, this time into the magnificent San Jacinto Mountains on the way to the lovely hill village of Idyllwild. Then descend into a series of beautiful, tranquil valleys on the way to a very remote Forest Service camp. No showers. Rolling roads through open meadows to start, then a long climb to Palomar Mountain, overlooking lovely Lake Henshaw. Very scenic: broadleaf forest and sprawling mountain meadows. Bulk up the short day with a run up to the Hale Observatory on the summit of the mountain. Tour the planetarium, then tumble down the hill to one of the nicest camps we’ve ever discovered. Showers. Perhaps the best day on the tour. Every mile is excellent, beginning with a world-class descent from Palomar and several more miles of slinky downhill across the Santa Ysabel Valley. Then a wonderful meander through another up-country apple orchard region…green meadows, little ponds, and New England-style farms, less than 50 miles from Mexico! Visit the well-preserved gold rush boom town of Julian and then climb in rolling, easy stair steps along the Sunrise Highway to a beautiful camp on the shoulder of Mt Laguna. Showers. A payback for all that climbing: a day of almost constant descending, and all of it twisting, curling fun. Scenery at the higher elevations at the beginning is almost alpine—in spite of being within sight of the Mojave Desert—but as you descend, the landscape shifts into a mix of chaparral and massive boulders…more what you would expect this far south. The ride ends up at a fun restaurant in the town of Alpine or at a nearby lakeside campground with all the modern amenities.